Two classes of tools are available for measuring the formation dielectric constant. The first one is low-frequency dielectric constant logging tools using coils on a mandrel, and more recently on a sidewall skid. They operate in the 50 to 200 megahertz range. The second type is high-frequency, 200 MHz to 1.1 GHz, using microwave antennae on a pad contact device. The first type was known as dielectric logs (DLT). The high frequency tools became known as electromagnetic propagation (EPT) logs. Modern versions of both types that operate at multiple frequencies are called array dielectric tools. 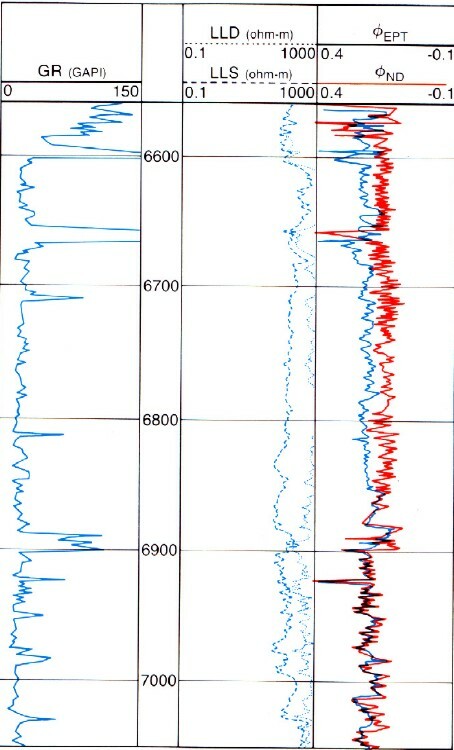 The Schlumberger tool scans 4 frequencies between 20 MHz and 1 GHz. The Baler tool covers 47 to 200 MHz. All these tools can be used to estimate invaded zone water saturation Sxo = PHIept / PHIt. Under the right conditions (shallow invasion, reasonably deep investigation) the Sxo may approach the undisturbed zone water saturation SWept. The measurement is relatively independent of water salinity at salinities above 10,000 ppm NaCl so it is a helpful guide to spotting hydrocarbons in fresh water environments. Its major use is in heavy oil wells, such as those in California and western Canada, and in EOR projects where water, CO2, and chemical floods have confused the original water resistivity regime. 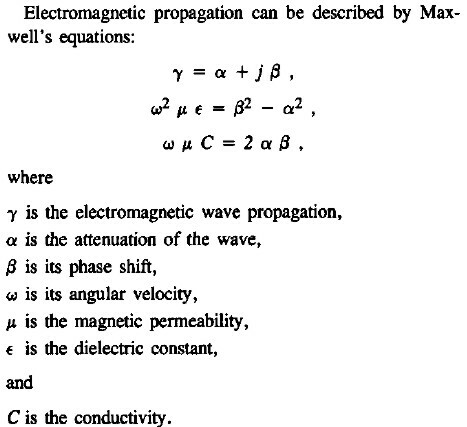 The electromagnetic principles involved in dielectric logging tools are described by Maxwell's Laws, summarized below and given in more detail HERE. EPT logs measure propagation time (TPLP and signal attenuation (ATTEN). Both are strongly affected by water so water filled porosity can be calculated from these values. As a 1 GHz tool, depth of investigation was very shallow. In heavy oil, where invasion is shallow, this water volume is close to the irreducible water. PHUept = PHIe only in water zones. Logging tools today use a skid-mounted transmitter-receiver array. Older tools were mandrel style and measurements were more seriously affected by rough or large borehole conditions. Bed resolution is a function of the antenna spacing and the firing mode. End-fire gives resolution of an inch or two and broadside a foot or a little more. 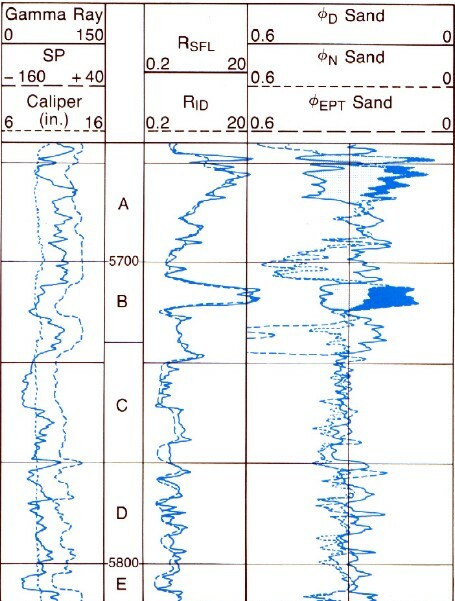 The attenuation curve on the EPT was an excellent shale indicator in laminated shaly sands, compared to the 3 foot resolution of a gamma ray log. and Rt, tool frequency, and firing mode. On low frequency DLT tools, curves presented varied considerably but might include attenuation, phase shift, relative dielectric permittivity, or resistivity. The advantage of the DLT propagation log is that the lower frequency permits a larger depth of investigation and therefore an analysis of the undisturbed zone may be more likely. Newer array dielectric logs measure at 4 different frequencies, giving a resistivity profile at 4 depths of investigation. They also measure signal phase shift, which can be transformed into water filled porosity and presented on the log. The Schlumberger array tool uses 20, 100, 500, and 1000 MHz for its electromagnetic scans. It makes a total of 9 measurements at each of the 4 frequencies at each depth level. The Baker array tool restricts itself between 47 and 200MHz. 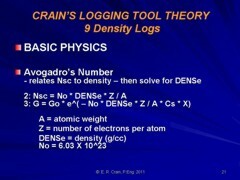 EPT log with deep induction, gamma ray, neutron and density. Zone A is gas (density neutron crossover, PHIept is low), Zone B is oil (no crossover, PHIept is low), Zones C, D, and E are wet (PHIept = PHIxdn). EPT porosity overlay on density neutron porosity shows residual hydrocarbon. PHIept (red) and PHIxdn (blue) in an oil zone. Oil water contact is located where red and blue curves meet near bottom of log at about 6860 feet. 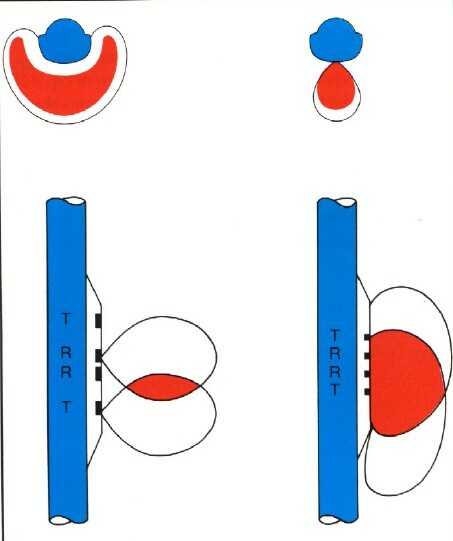 Resistivity contrast (Track 2) does not define contact clearly. Porosity curve separation is only a hydrocarbon locator, as this is light oil, with invasion. Comparison of array induction, carbon oxygen, and dielectric phase logs. The multi-frequency dielectric dispersion measurement clearly enables interpretation of the hydrocarbon zones from X260-X280 feet and X340-X440 feet in (Track 5). 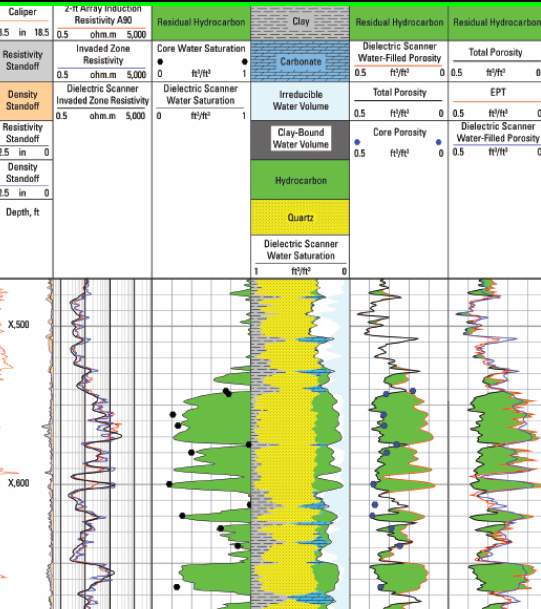 The standard triple combo log was overly optimistic, showing freshwater zones as potential oil zones. 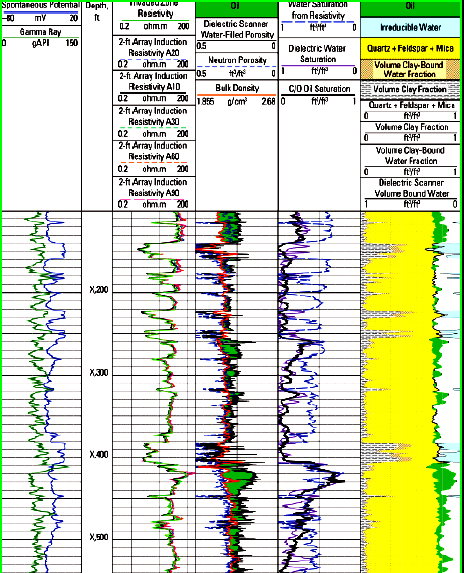 Comparison of dielectric scanner results (Track 4) and EPT results (Track 5) shows high hydrocarbon volume in rough borehole. The skid mounted multiple detectors on the DPT reduces borehole effects.